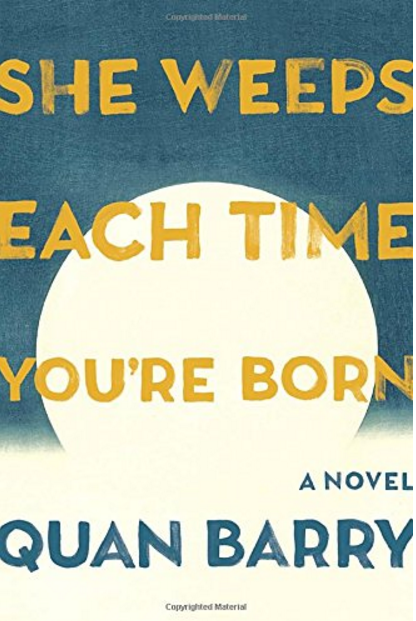 diaCRITIC Jade Hidle reviews Quan Barry’s fiction debut, She Weeps Each Time You’re Born; a novel that merges together Vietnamese history, magical realism, and heaps of dream-like imagery. Though these images are lastingly vivid, these nightmares are often numbing. They prevent me from waking up even when I am lucidly trying, and when I eventually do my brain feels foggy for hours afterward. This disorientating dreaminess punctuated by vivid images is the feel of Quan Barry’s new novel, She Weeps Each Time You’re Born. Bookended by the protagonist Rabbit’s 2001 return to Viet Nam, the novel covers decades of Vietnamese history from 1972-96, all focalized through Rabbit’s prescient, magical realist abilities to hear the voices of the dead. Like dreams, Barry’s prose is imagistic, evincing her background in poetry. (She has won the AWP Donald Hall Prize for Poetry.) The novel opens with descriptions of “dragonflies floating fat and red,” “the landscape lush and meditative,” and the “crickets and frogs starting to call” (3-4). I had to suspend my kneejerk reaction to critique these typical, romanticized depictions of an idyllic Viet Nam, as I reminded myself that this nostalgia makes sense for the character who is returning to Viet Nam and attempting to rediscover her homeland. But these nature-centric, ethereal images continue when the novel jumps back to 1972 and throughout the book. Sometimes this lingual craftsmanship creates evocative, painting-like impressions—for instance, “the horizon pinking” (92) or “The air fill[ing] with the sound of ringing, like a needle imperceptibly vibrating with human electricity, or a fly’s wings beating to keep it aloft” (31). However poetic, these recurring plays with language began to inundate my senses. Everything began to taste like honey, milk, and blood. Lots of corpses. Lots of breastfeeding. Including a milky Grapes of Wrath throwback. At times, the tone evokes fables. While I can see how Barry’s aestheticized prose would appeal to readers seeking a sensory tour of Vietnamese history, its oversaturation thwarted my identification with any of the characters and my investment in the forward momentum of the plot. I do not consider myself a reader who seeks eccentric characters or plot-driven stories, but rather than open up narrative avenues that would make me want to keep reading, the ends of Barry’s chapters tended to close down with the weight of a symbolic image—for instance, Qui “plucking bits from the red chrysanthemum and quietly slipping the tufts in her mouth” (176) or when Rabbit “felt the wave cresting in her body” (180). These felt like the poetic equivalent of the mic drop. Nevertheless, the motif of water sets a sometimes intriguing aquatic tone and form of the novel, ebbing and flowing between images, points of view, and periods of history. (This fluidity reminded me of the tidal structure and themes of lê thi diem thúy’s The Gangster We are all Looking For, one of my favorite literary works.) Much of Barry’s novel revolves around water—namely the Song Ma River and the surrounding seas—and its simultaneous generative and destructive powers. Just as Barry writes that “[w]ater is the trickster element” (124), Rabbit mirrors the tides of the narrative in magical realist proportions. Far exceeding the expectations of her age and appearance, Rabbit’s prescience is clear in Barry’s descriptions that she “could feel,” “could tell,” and “knew” just about everything. What’s more, Rabbit has the ability to hear the dead, some “voices […] so old they seemed to speak another dialect” (104), which is one of many instances in which the novel blurs the line between life and death. (There are bodies everywhere in the novel, and Barry’s language spotlights the visceral stories those bodies tell.) With this surreal yet emotionally relatable capability to access oft-silenced histories and traumas, Rabbit parallels the country and history of Vietnam. For instance, when Rabbit enters the story, the Americans retreat (52), and when the Khmer Rouge kills three thousand Vietnamese, “Rabbit lay burning with fever” (99). Rabbit is emblematic of how histories ripple under the skin, arterializing collective traumas that are not to be forgotten. As history embodied, Rabbit offers readers the opportunity to witness widely known eras of French colonization and Communist North Vietnamese occupation. The book offers glimpses into the atrocious realities of “đổi mới” (a “new era”) during which Vietnamese experienced “Southern society turned upside down” (116) under the Viet Cong’s euphemistic guises of “reunification and reeducation.” Barry shows these traumatic events through scenes in reeducation camps wherein those deemed “traitors” to the new Communist regime are subject to backbreaking labor and cruel, inhumane torture such as being coffined alive (137). Through language, Barry also paints desperate boat people fleeing to refugee camps, many of whom meet untimely deaths at the hands of marauding pirates and rough seas (142-157)—tales that unnervingly, heartbreakingly resonate with the treacherous journeys Syrian refugees have been embarking on in the past few months. Ambitious in scope, the novel also includes aspects of Vietnamese history that are not often portrayed, including Cambodians’ viewpoints, however limited and militant, of long-building tensions with Vietnamese: “We must strike the Vietnamese in their beds, crush the baby in the womb” (121). The Russians, on the other hand, are portrayed quite sensually, as Rabbit hears voices of the dead emanating from the body of a soldier who makes love to her in the rhythm of the sea. If you are interested in learning about Vietnamese history or enjoy the reverie of linguistic craftsmanship, Barry’s novel may be for you. Though I admire Barry’s marrying of poetry and history, I found myself wanting more story and character over style. Jade Hidle is a Vietnamese-Irish-Norwegian writer and educator. She holds an MFA in creative writing from CSU Long Beach and a PhD in literature from UC San Diego. Her work has appeared in New Delta Review, Spot Lit, Word River, and Beside the City of Angels. Very thorough review. I tend to favor story over style, too, so I suspect I’d have many of the same comments.